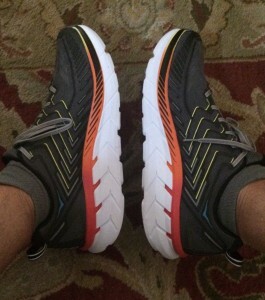 I just recently took my new pair of HOKA One’s out for a test spin. I saw HOKA burst onto the running and triathlon scenes a couple of years ago and my curiosity was piqued. While historically I have been somewhat a moderate to minimalist to a neutral shoe wearer, I had to check these out. It was actually my meniscus surgery earlier this year that prompted the move. I’m happy to say that my first run was pretty amazing and I literally felt like I was running effortlessly downhill. If they continue to feel good this week, I will race in them in Lake Placid. And if that goes well, I’ll wear them in my fall marathons. If THEY go well, I’ll be hooked. Worth checking out HERE. This entry was posted in racing, running and tagged hoka, hoka one. Bookmark the permalink. Both comments and trackbacks are currently closed.